My "Not Dante" model is still going to be leading a Death Company. 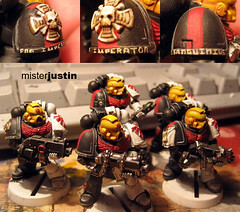 Because my army is black/white I decided to call these guys the "Blood Company" and put them in all red armor. For the sake of fluff I'll say that these are original suits of Blood Angels armor from the second founding. Conversions are simple arm swaps and removing the silly bits of terrain some of their feet were attached to. The latter gives a better impression of landing and also eliminates the image of these highly trained soldiers landing on sharp piles of rubbish. I've been working on the weathering techniques and colours for my winter themed Imperial Guard army. Not that I'm going to get to it any time soon -- but it was a good excuse to practice vehicle weathering and snow application. The snow is PVA, water and baking soda. The mud was applied using water, pastel pigments and PVA; I also dipped the brush in static grass every now and then for additional effect. Additional stowage is from Venderlein -- although I'll apply it differently on future vehicles and not add any cloth to the hull. It's snowing, raining and horrible -- not so much "put your backpack on the tank" weather. This is a Forge World "Death Korps of Krieg Commissar" I'm doing on commission. He is mounted on one of my resin display bases. The colours were client specific but I asked to practice my NMM on this one. Except for the basket on his sword I'm pleased with the results. At this stage he's roughly 50% completed. The model itself has been a pleasure to paint. I'm likely to get one of these for myself. Although my "counts as Corbulo" model is a bit more plain than I might have liked I'm very pleased with how he's coming along. His plainness will be offset by the fact he's the only Apothecary in the army. Here they are with just a few little details and white highlights to go. I still plan on going back to touch up the tiny, tiny lettering and maybe add a highlight to it if I can. The scratch built Warhound Titan I traded Psypath for. It's an incredible model that's waiting for detail sculpting and then painting. I can't avoid it any longer. Niroe (aka Bill N.) has commissioned an almost all Forge World Krieg army. This behemoth, a Macharius Super Heavy Tank, is getting the full treatment. Well, nearly. I didn't break out the airbrush on this one but I did do some salt chipping and a three colour camo using masking putty. It's off to a good start at 2:07 into the project. The first Tactical Marine is finished. Because the chipping was easy enough to do, and turned out pretty well, I'm going back to the Assault Marines and adding it to them as well. The black was done with Polly S "Grimy Black" and makes a wonderful near black grey colour. Using straight black on top of it allows for decent chipping. The white was done with VMC "Off White" and a touch of GW Fortress Grey. The highlight was... white. Go figure. The whole of the army should be up to this standard if I can actually get it done. I've decided to do all of the marines with yellow helmets. I will use the black shoulder to do the squad number and type identification. So this guy is a Tactical Marine - red - and he's from the 1st Squad - 1 stripe. Squad 2 will have 2 stripes. Go figure. I also have updates on "Not Corbulo" but I haven't had time to get decent photos. Even this guy looks seriously washed out thanks to a quick photo under the sun. Ah well. One of these days I'll take photos I'm happy with -- until then I'll have to be content knowing the model looks better than the photo does.